Dickens, who's already written most of the stories there are in the world, seems to best express how I feel about the past year. Yes, from A TALE OF TWO CITIES, that whole best/worst thing. Although maybe not. I can imagine worse, although I am fearful to, and I can also hope for better. I'm speaking about the world in general, here. For me personally, many parts of 2018 were good and others were, uh, less good. How ever un-good my "less good" times were, I'm still very fortunate and I know it. The two best lessons I learned and practiced, both toward the end of the year, are what I'm clinging to as the earth rotates and revolves around the sun. Yep. Simple. But not always easy. This last quarter, I've focused largely on taking care of family, including myself, in projects with both short- and long-term timeframes. I hope to be able to look outward and better care for others in the world in 2019. See you after the page-turn. For this post, here's one given: a "good" review is one that contains information valuable to someone other than the reviewer. Which means that "I liked it" or "I didn't like it," as expressed by thumbs up or down, aren't helpful reviews. For a positive example, here's a link to the YouTube channel (where you can find her playlists) of Cindy Guentert-Baldo, with some amazingly helpful reviews, if you're interested in various types of pens and planners. NB: she also has an awesome website, here. Cindy is one of the most upfront, thoughtful reviewers I've run across (and I've been watching a lot of online reviews of various consumer and other products in the past year). Two qualities contribute to her success as a reviewer. First, Cindy knows herself. And second, she considers other perspectives. Cindy is experienced in graphic design and hand-lettering. She is right-handed but she has a teenager who's a lefty (this makes a big difference when pens don't dry quickly). She's what she calls "heavy-handed," which apparently means she presses down heavily when writing (and probably grips pens tightly as well). She likes a pen you can cap with a satisfying click, and whose cap stays on the end when you're writing with it. In relation to planners, she also has firm preferences. She is suspicious of overly complicated systems that dedicate multiple pages up front to specific "how to use this planner" content. She likes good-quality paper (and evaluates the extent to which pens ghost or bleed through). In a pre-printed planner, she prefers neutral colors or monochromatic color schemes, so that she can add colors herself. She shares her preferences with her viewers. She also acknowledges that her personality isn't for everyone--she's "salty," as the kids say. * that some pens are fine for watercolour projects, when you might not be in a hurry, but would be horrible if you're trying to do quick lettering or just write something in a notebook. BUT WAIT, there's more. Cindy KNOWS the MARKET. She evaluates pens in a (yearly?) Thunderdome, pitting pen against pen in several categories. She tries planners. Lots and lots of planners. The kind that start in July, the kind that are undated, the kind that "everybody" knows about, the kind that fewer consumers know about. The kind that are "just notebooks," not that anybody uses "just notebooks" these days. When I apply these qualities of her helpful reviews to books, I can see why so many book reviews irritated me to the point that I stopped reading them. (Besides telling me too much plot, sheesh.) Reviewers often seem unaware of what they like (astonishing)--it's fine to prefer wordplay to a book whose plot includes with a cliffhanger at the end of every chapter, but you should know and disclose that you go into a reading experience with that bias. Instead, I found that reviewers express their preferences in terms of absolutes--for example, "this book is tedious and bad because every chapter ends with a cliffhanger." Well, how about "if you don't like books with lots of cliffhangers, this won't be for you"? Because I MIGHT BE DIFFERENT (sorry for the shouting). Sure, various retailers and book-sharing sites try to use an algorithm, some "if you liked that, try this" thing. But their algorithm doesn't work well for me; it apparently includes sales or bestseller lists. Instead, I find my personal knowledge of individual readers to be a better predictor for me. For example, I know of two people who loathed the book that was my favorite of this past year. They also both (independently) hated one of my faves from a few years back, and one of them has given up altogether on a writer whose work I adore. All of which I find fascinating, because I consider both of them to be discerning and thoughtful readers. So: I'm not a good reviewer of books. I'm not interested in today's market enough to carefully and correctly place a book in its place among others published in recent years. I'm not well-enough-read to have a decades-old landscape of historical work in which to place today's books. I am grateful for creators for going through the process of creating, and to publishing companies for making them widely available. And to libraries for making it possible for me to read things I don't have to buy. But I still love me a good review, of almost anything other than books. I have a fun new notebook for the new year. And I know what set of drawing pens I'm going to buy tomorrow--thanks to Cindy. Difficult news in Thunder Bay. Another young life lost. More defensiveness and shoulder shrugs. And a new report that attempts to create some sort of accountability for the past. I can read news reports, like those linked above. I can read all sorts of public documents, but I am all too aware--having been a person who wrote documents--the silences and omissions and safe statements in much public information. For a couple of years now, I've been trying to listen for underrepresented voices and lift them up. It doesn't matter whether I agree with what they say. I try to understand. I get burned out and take a break. I go back and try again to read and learn, and (hardest of all) to curb my desire to "weigh in" and argue and question. In recent years, parts of the Canadian literary community have also been trying to lift up Indigenous and other underrepresented voices. Recently, this collaboration between Prairie Fire and CV2 appeared in my mailbox. And what a lovely collaboration it is. Curators Katherena Vermette & Warren Cariou discuss what they mean by "ndncountry," and the difficulty in choosing the pieces to publish. They close with gratitude to the publications, sponsors, and to the writers. And finally, they thank the readers for their interest, saying that they hope readers "will return again and again to savour this work. Go with love and respect, and you will be rewarded." I haven't experienced all that Randy Lundy describes, but this fall, this birthday, I recognized this feeling. 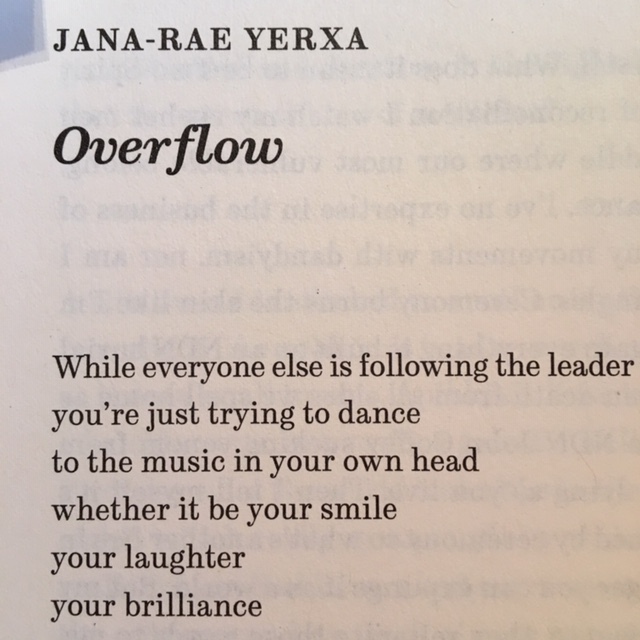 Another special moment was turning to this poem, by Jana-Rae Yerxa. I loved the whole poem (BUY AN ISSUE TO READ IT ALL! ), and I was thrilled to read about Jana-Rae and realize that she studied at Lakehead and lives in my (metaphoric and literal) back yard. No, wait. We share a back yard. Um. Actually? I live in her back yard. And that of the other writers in this volume. And I'm grateful, so grateful, for the opportunity to get to know them all better. So here: I'm now saying this. Buy this magazine, as well as other literary magazines in Canada that lift up underrepresented voices. (The names above have links, and they're also listed below.) Read the work, several times. Talk about it with your friends. "Return again and again to savour this work. Go with love and respect, and you will be rewarded." Last week, I wrote about my November book, Little Women. As is always the case when I read my "old faves," I was uncomfortably aware of statements and omissions that are, frankly, racist and classist. And I wanted to get some perspective. So I did, at this invaluable resource: American Indians in Children's Literature. Dr. Debbie Reese founded and managed this resource for years, and now has help. An enrolled member of the Nambe Pueblo in New Mexico, she has also held positions at the University of Illinois. She and Jean Mendoza share their reviews of books--both books they recommend and those they don't (with reasons why)--and welcome thoughtful comments and discussion. Although Little Women isn't discussed much, many of my other childhood favourites are. I've learned a lot from the resources and conversations. I would say that I don't always agree with the perspectives, but that's really not my place. I have too much to learn. I may have linked to it before, but even so--it's not as if these conversations are somehow not relevant anymore. Go there and check it out. Recently I've been thinking about how strongly I associate books with particular months or times of the year. Last week I shared my October Book and why it suited October. Previously, I talked about the surprises of rereading a book I always associated with September (which may more properly be a May book). Which brings me to November, the month of my birthday. Back in the Days of Yore, a calendar (printed! on paper!) was considered a wonderful and appropriate (and somewhat affordable) gift for a hard-to-buy family member--a father, say, or a brother (or three). In my experience, November gets the most boring pictures. The best are January (usually the cover), something stunning for a summer month (often July), and a cozy interior scene for December, which if not explicitly about Christmas is at least about indoor warmth, hot chocolate, and a roaring fire. Of course, being me (a person who holds meaningless grudges against monolithic institutions and incoherent concepts long past the usefulness of the grudge, institution, and concept), I began to choose calendars based on their November pictures. If November was a dud, I didn't buy it. Take that, capitalist society! For many years, I made calendars for my family from photos of this place, and I put the BEST picture in November. Which was sometimes harder than it sounds, because I used photos from that month in that month. And even in this place I love so dearly, November can provide a cold, grey stretch and a muted palette of grays and browns. The general disrespect for November--a month to be hustled through, days to draw an X through before the end-of-year feasts and gift-giving--is why, as a young child, I was so pleased to read the beginning of this chapter of my November book, Little Women. Jo March was also born in November! Set aside the fact that trouble does come for the March family, in a big way, in November. Good people were born in it--ambitious people, idealistic people, real people. I've learned through the years that Little Women is often considered a December or Christmas story. Not for me--it's November, all the way through. And that didn't change in my most recent re-reading. One element of the story that stands up the best, for me, is Alcott's distinction between wise resolutions made in a moment of inspiration, and the daily, everyday drudgery involved in carrying them out. That's November right there, in all her glory. Like most little girls who a. wanted to write and b. never knew the proper thing to say in social occasions, I identified with Jo. Through the years I grew to appreciate her efforts to try, in various ways, to learn from the virtues her sisters possess. For example, when Amy, not Jo, is chosen to go to Europe, Jo says, "I'll take a leaf out of her book, and try not only to seem glad, but to be so, and not grudge her one minute of happiness; but it won't be easy, for it is a dreadful disappointment." As a writer in a community of writers, being glad for others--truly being glad, not just seeming so--is a handy virtue (and not easy). This time around, I found kinship with different character--much to the surprise of this never-pregnant non-mother, it was Marmee. Yes, Marmee possesses extraordinary wisdom and has an uncanny ability to to provide comfort and sympathetic counsel to her daughters--not like me at all. But, despite the loving family gathered around her, she is relentlessly alone. As we all are, eventually. Imagine my shock when, after skipping ahead five years from Jo's marriage at 25, the family celebrates Marmee's 60th birthday. Just 60! How young she was, not even 40, at the beginning of the story. Of course, it's impossible to read anything beloved from childhood without noticing uncomfortable erasures. Many stereotypes tossed out casually. Many voices simply not there. I thought of Hannah, perhaps because of Longbourn, by Jo Baker; and of the poor immigrant families who are the object of "charity," even for the also-poor March family; and the reasons for the Civil War that looms so large at the beginning of the book. I noticed that in this work, as in many of Alcott's stories, "going West" holds the answer to everything--but "the West" was not actually her romantic vision of it, and the people she blithely assume would "succeed" there were destroying whole peoples. I can't defend all that, so I won't even try. I'm older now--not yet 60, but not far off, and closer to 60 than 35, to say nothing of Jo at 15 or 25 or 30. Like Marmee, I see the world with different eyes than the March girls. Now, I'm sorrowful, slightly more patient, and less (or perhaps differently) idealistic. I have learned--am still learning--to see beauty in all the many shades of gray. I'm grateful for the chance to experience them in this re-reading of my November book. * Also: horses, hats, and lots of rowing. What is not to love? ** I don't agree with Acocella's dismissal of Little Men and Jo's Boys, however, nor her boredom when Amy's European story and Meg's household trials become central after Beth's death. But that's OK. We all read with different eyes. In September, I posted about a book that I always think of in September. I meant to do one in October, but I didn't have a chance to revisit this old friend until now. So even though it's November, here's the October book: Mrs. Miniver, by Jan Struther. No, not the movie, lovely though Greer Garson might have been in it, and important though it might have been in showing Americans what was at stake in the war they had so far (in 1940, when the book was compiled and published) refused to enter. Nope. It's the book, the text of which is available online here, along with lots of notes about what was and wasn't "real," and what made it into the movie and what didn't. I think it's worth reading, but I'm biased. Actually, this book could serve as a September book as well. It begins in September of 1937 and ends just after war is declared in September of 1939. In a series of slice-of-life vignettes set roughly two per month (evidence they originally appeared serialized), Mrs. Miniver reflects on life and its changes with perception and generosity. And I associate it with Christmas. One of my favourite scenes is Christmas morning in 1937. The three children of the family--Toby, fiveish; Judy, nine; and Vin, who's old enough to be off at school (this is an upper-class family) but home for the holidays--come into their parents' bedroom and open their stockings. It's a lovely scene, "laced with an invisible network of affectionate understanding," as Mrs. Miniver watches how her children approach the stocking toys. As it's time for morning tea, the moment ends. Mrs. Miniver looked towards the window. The dark sky had already paled a little in its frame of cherry-pink chintz. Eternity framed in domesticity. Never mind. One had to frame it in something, to see it at all. 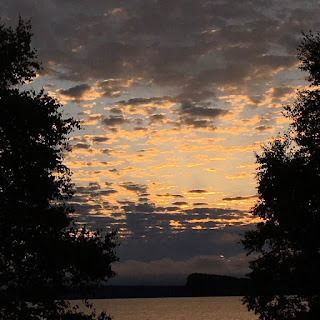 On a recent morning, I sat in our lakeside family room, waiting in the dark for the sun to sidle above the horizon, and thought of those lines. My mother, about whom I write so much, first introduced me to Mrs. Miniver. I was probably in high school, and read it without much understanding of the greater issues or the context it which Jan Struther wrote. However, I found Mrs. Miniver perceptive and thoughtful and enjoyed the book for that reason. My mother ensured that I wouldn't forget Mrs. Miniver when she gave me my very own copy of the book--a signed first edition, at that. More important to me is the sight of my name in her handwriting, on the note that accompanied this Christmas gift. Now that I too live with a sense of impending doom, increasingly aware of treasured rights that some have never had and the rest of us can easily lose, I feel differently about the book. Yes, I see the social inequalities of the time and I recognize that they persist today. Yes, I see attitudes toward poverty and race that are, frankly, uncomfortable to sit with. But I also see a writer struggling to express, in her time, the surprise and inevitability of war. The impossibility of conversation with people about politics. The similarities between her own young son and the young German-speaking boy at a Swiss pension where she stayed briefly. The pride in learning reef-knots and first aid and neighbourhood responsibilities. I feel a kinship with Jan Struther and her alter ego, Mrs. Miniver. Re-reading this book during the past few days has let me spend time both with the perceptive Mrs. Miniver and with my own insightful, brilliant, surprisingly sentimental mother. What a gift it has been to read this book, in its imperfect glory, this season, and remember why it's a good book to read in any month. With gratitude. This morning I noticed that our outdoor thermometer showed very little red. The temperature has been dropping recently, and it got cold last night: near 0F/-18C. So: the thermometer. I considered taking a picture of it. I considered what I'd say: "Soon, this temperature will lose its shock value, but today? Yikes." I didn't actually take the picture, though. I thought maybe something else interesting would turn up. The lake looked interesting, and I was up early enough to watch the light change. So I started my morning social media/email check-in. Facebook showed me a memory from this date four years ago. The thermometer, at nearly the same temperature. Nearly word-for-word the "shock value" quote above. Predictable much? Every year, I try to embrace winter as it appears. I really do enjoy winter. After I have mitts in all the jacket pockets, after I remember the rules for scarves (fleece go with coats that have velcro closings; zipper-closed coats are safe for knits), after I have zipped the warm lining into the shell, I'm happy to bundle up and get out in it. However. I sometimes find transitions difficult. Well. Given that post from four years ago, apparently I always/usually/often find this particular transition difficult. So I'm right on schedule for this cycle. Which is reassuring, I suppose. And as I continue thinking about attention--mine and the attention of others--I wonder what other cycles I'll find. One thing's for sure: it's time to re-acquaint myself with my sweaters. * Or perhaps my family is just being nice. But it's still a lovely place and I still enjoy taking the photos. Here are a couple of quotes from What Light Can Do, collected essays by American poet, translator, and critic Robert Hass (2012). "One of the things I love about the essay as a form--both as a reader and a writer--is that it is an act of attention. An essay, like a photograph, is an inquiry, a search....There are a lot of different ways to write essays, a lot of different ways to say thing, so the pleasure and frustration of writing essays is that you are often discovering the object of inquiry and the shape of the search at the same time...."
And later: "The deepest response to a work of art is, in fact, another work of art." I've been thinking a lot about attention. Times when giving attention to something grants it power. And other times, when something gains power through our inattention, when we deliberately ignore it or maintain ignorance about it. For the past few months, the Thunder Bay Art Gallery has hosted a national touring exhibition of Uprising: The Power of Mother Earth, images by celebrated Métis artist Christi Belcourt with artist and storyteller Isaac Murdoch. The exhibition is important for many reasons, and it's worth reading the museum's page about the exhibit (linked above) if you can't experience it first-hand. The images are breathtaking. The number of images allows you, wandering through a space, to see how her work has changed. You can see where she has placed her attention and how she directs your attention. How backgrounds, even away from "the action" of a piece, can reward your attention. How she considers elements many times in different forms, saying something (or allowing you to see or hear something) different every time. I've been thinking about the quotes and the exhibit in relation to attention. Specifically, where I put my attention. Where do I direct my attention? Where should I? Many sentences with a ? at the end are NOT actually questions. * How could you do this to me? * What were you thinking? Many requests for input/feedback/thoughts are NOT sincere requests. Silly me, I keep forgetting this corollary. So if someone asks what I think, I forget my lines. * Gosh, I don't know. What do you think? * It's perfect as it is--no changes needed! * Oh, I'm sure you're right! Remembering these lines would save me time. I wouldn't need to inform myself. I wouldn't need to do the work and actually listen to the podcast, read the article, read and analyze the book and its sources, read the conference program, consider the program guidelines, read the sample work, read the background, or ground myself in the context around the larger conversation. I could allow my previous experience to dissipate--whether it's experience in writing, studying qualitative and quantitative research methods, reading in public policy, communicating science, performing service to the community, editing and publishing, completing grunt-level bureaucratic tasks, or evaluating programs. I could allow (even more) people to tell me things they don't actually know. Loudly. Insistently. Sometimes, listening might be my actual work in this world. But sometimes, I'm not willing to let people yell opinions as if they were facts. I'm not interested in giving people time and space in my vicinity in which to speak with willful ignorance. I could say instead, "Would you look at the time. See you!" And then leave. After all, waves crash on the shore. Trees lose their leaves. The moon rises. On a clear night, a shooting star might say hello. I would like to serve as witness to these things. I am welcome there. Full disclosure: I am not always clear on this myself. Sometimes I ask for input when I'm really asking whether this thing I'm doing is worth working on at all, whether it holds even the slightest speck of potential value. I ask for "honest feedback" when what I really want to know is whether this I'm just a horrible, suspicious, boring human being (with undernotes of tediousness and smug irritability). So, maybe, THERE is my actual work: listening to the statements that are behind the questions-that-aren't-questions and the requests-that-aren't-requests. * Why are you asking? * There may be other resources out there on this. * Why do you feel so strongly about this? * You seem to feel very strongly about this. * What kind of input are you looking for? * Your work is thoughtful, even in rough form. * You're the only person who can gauge whether you're finished, whether this is ready, whether you need more information. * What's the worst that could happen? * You seem hesitant to take action. In other words, sometimes my work is to listen. Really listen. But more often--especially lately--my work is to leave. With a smile. Would you look at the time! The buck's in the back yard, foraging at the lilac bush. I must go watch. 1. Tanis MacDonald, Out of Line. Thoughts on being an artist outside of The Big City (as you define it). Addresses lots of issues of class. Contains lots of truths, both hard and inspiring. * "What is there to say about not winning, or even not being nominated? This is the state in which most writers live their lives" (p. 163). * "Artists need to be sensitive, but they also need to be tough" (p. 169). * "Don't worry about a grand plan. Produce work. Make stuff" (p. 174). 2. 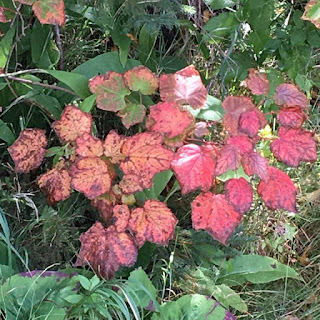 The simply lovely blog by Alberta writer Shawna Lemay, Transactions with Beauty A photographer and writer, she shares words AND images AND bits of poetry from others. It's a treat to dip in, and she updates often. Here's just one recent thought, from a few months that have felt especially difficult (although perhaps most times feel especially difficult). * "But there's something about good writing by women that makes me feel less despondent" (August 17, 2018: "Maybe The World Isn't Such a Bad Place"). A quintessential October image: coloured leaves. Lighting a tree. Swirling through the air. Chasing other leaves down a rivulet. Lying on the ground in splendid repose. After an intense and busy season--"season of life," not specifically this summer, though that too--all my focus, attention, intensity, whatever you call it, seems to be devoted to sleeping and goofing around. I'm trying to listen to myself, which includes listening to my body. Because who knows, really, how long this turn will last--the turn toward fallow, toward rest, toward yin from yang. Yang in the weather will re-approach in the spring, with the sun, but other outward-facing projects might appear regardless of weather. 1. The unique satisfaction of a reading wonderful library book that turns out to be every bit as wonderful as was claimed. I feel this especially keenly because the previous library book turned out to be a dud--though that's unfair, really. It was a dud because I was reading it with a friend, and I had to reserve it in July, and it just came last week, and it was the kind of book that, had I seen it somewhere in real life, I wouldn't have read. I tried to read it. I didn't like it. And I took it back instead of slogging through it (go me). Which makes the more recent book all the more wonderful. It's Ann Patchett's This is the Story of a Happy Marriage, which is a lot about writing and life and love in all its forms and only a little about marriage. 2. The dawning realization that it might be time to cull the fleece. We're just coming into the Season of Cold, so maybe now isn't the best time to cull all those sweatshirts/hoodies/jackets/layers-that-aren't-sweaters-but-aren't-coats. The thing is, that clothing category in my closet comes with lots of rules for appropriate wear. For example, this one is OK only to get the mail and run into the convenience store an emergency grocery purchase. This one really can't leave the house except under a coat that will never be unzipped. This one can't leave even then. This one I could wear to coffee or for a work day in town but only with people I know well. Hey, here's one I actually work out in. Etc. Also: that this is even a "thing" indicates that my life a. consists mostly of days working from home, b. in the north (though if you look at the whole continent, this isn't so north, but still). Some leaves I catch on paper and toss into the bag behind my desk where I keep random bits of things I might find interesting someday. 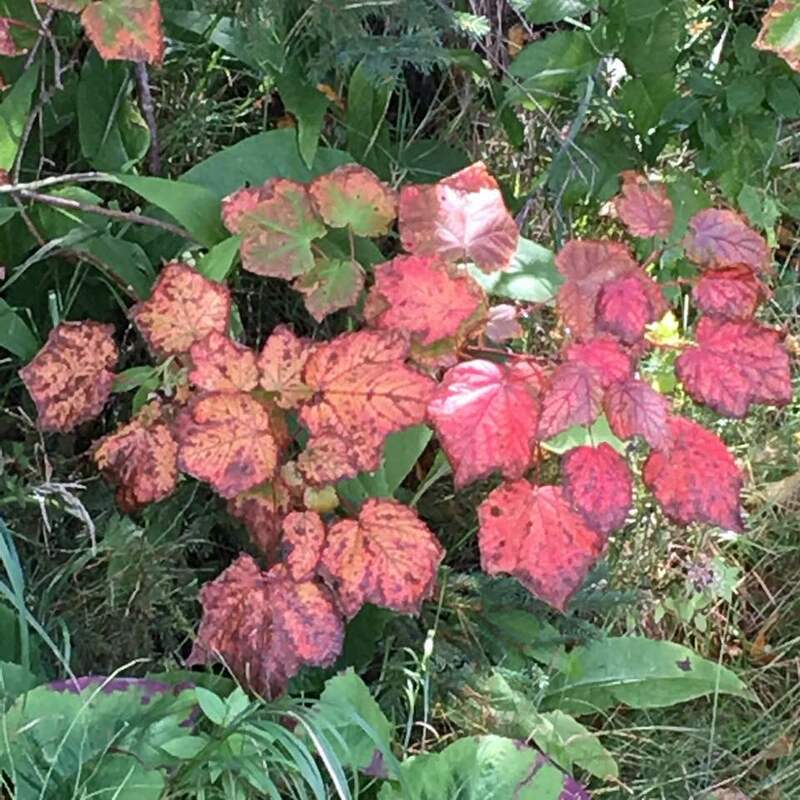 Some leaves I allow to simply swirl away to find their repose and combine with others as they contribute to the next fertile season. Are leaves swirling around in your head these days? It's a glorious season, inside and out. I'm grateful for women who speak up at great personal cost. 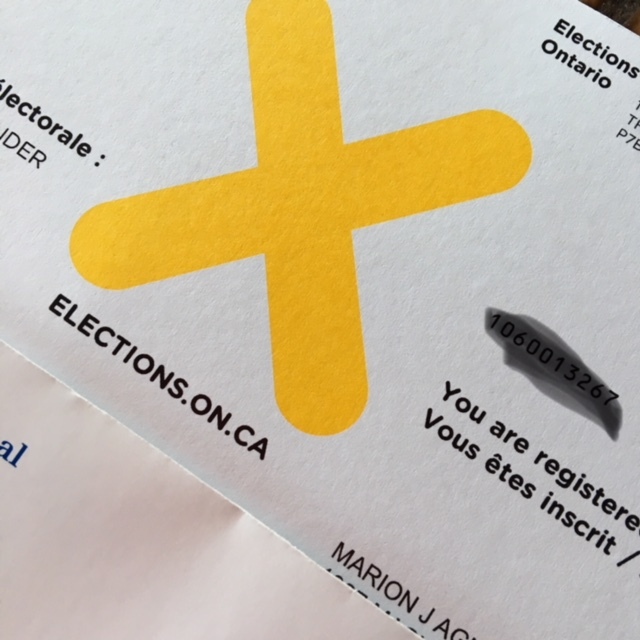 I'm grateful for the opportunity to vote, even when it is the very definition of an exercise in futility. I'm grateful for people who wield their power to make life just a little easier for those around them. Today, for example, I read a tweet from a teacher who talked openly with his students about navigating higher education. He told them that they were welcome to ask him for help with assignments, how to schedule an appointment to talk with him or other professors, that deadlines could be altered for some situations, that it's always better to be upfront about struggling than pretend you're on top of things or know what's happening. He's using his power and position to help level the playing field for students who are the first in their families to access higher education. He's making explicit those norms and unwritten rules that those familiar with campuses already understand. For what he is doing to allow students to create a better future for all of us. For her courage in speaking truth to power. For the system that allows me to show my elected officials how I wish they treated people. Some weeks are like that. Some weeks, you know you're fragile. Cracks appear. Some weeks, you can hold it together. Some weeks, you can't. And that's OK, too. *Are we in North America lucky? Or perhaps, "lucky"? We have not yet been swept away in flash floods, mudslides, wars. Our homes aren't flooded or crumbled. On a break, I wandered through shelf after shelf of novels. I took one down and flipped through it. As I recall, on the very first page a seventeen-year-old girl wakes up to a fresh autumn morning full of golden leaves and sunshine and declares herself to be the future famous and beloved actress, Marjorie Morningstar. She even writes her name in an affected script. She's adorable. Also at a crossroads in my life (though different in important ways), I recognized that feeling of expansiveness. Anything seems possible! I can go anywhere! The whole world lies ahead! I was as hooked on Marjorie as she was on Noel. I checked the book out of the library and finished it in one or two more gulps. In a used bookstore, I found my own copy of Marjorie Morningstar. Every September for fifteen or more years, I read it again. I'd heard of the author, Herman Wouk, but as the writer of The Winds of War and War and Remembrance, which had been made into a couple of miniseries. (I didn't have a TV at the time, but I wouldn't have watched a World War II story.) I didn't realize Wouk had written other books, or that I'd find them approachable. His novel The Caine Mutiny received much acclaim. I also enjoyed another of his non-war novels, Youngblood Hawke, but at 800 pages, it's not so easy to add to a re-read pile when the to-be-read pile grows so tall. In September, fourteen years ago, I began the process of moving to Canada. Since then, I've fallen out of the habit of my September date with the growing-to-adulthood Marjorie. Last week, as we reached the part of September that properly belongs to Autumn, I pulled the book off the shelf again. Imagine my surprise to see that it takes Wouk four pages to get to the script-written Marjorie Morningstar. And that the book opens in May. Not September at all! May! But those are mere distractions. It continues to surprise me, pleasantly, how central Marjorie is to the book. The choices she makes drive the story. I might wish she chose differently and felt she had different options open to her. But the questions she asks herself are important and real. And yes, that September feeling remains. September, a time of new beginnings. Back to school. Vacation's over. New shoes, new winter coat, new pens/pencils/notebooks. New routines. Starting again. September, a time of letting go. Summer's heat wisps away, a little at a time. You hardly notice. Then the furnace kicks on. You look up and around and see things like this and this. September holds nothing back. It teases you with a little summer yet hints at winter. "Look up, look around, look at me," it urges. And so we do. It's a transition time--as I have said a few times, from "yang time" to "yin time," from publishing and submitting and revising and writing about writing to a more inward-focused time, when (if you're lucky) you can do the actual writing itself. What's coming is time for research, and dreaming, and the delightful frustration of new drafts. I forgot about a load of laundry--left it in the washing machine (ostensibly clean) overnight. Mid-morning, when I remembered it, the load stank in that sour way of wet things in an enclosed space. In other news, one of my characters threatens to disappear into the ether of digital manuscript pages. He needs to be a little more charismatic. Even if only to himself. A problem to solve. Not something to despair over, no matter how real this person is (to me) and how thoroughly he lacks charisma. Taking a break for much of August, as much as I was able to, has turned out to be a good choice, especially after ten days in Saskatchewan working in-depth on this novel. Perspective, I believe it's called. I may wander away from social media even more as summer wanes and autumn arrives, the better to keep solving problems that inevitably arise. I don't like my pen. It blotches. The ink gets all over my fingers, even after I've given it time to dry. It's a pain in the neck to use. I don't like my pen. I really wanted to like this pen. It came in a cool package with pens of various colours. I like using coloured pens--green, red, or this purple--during the day. I had high hopes for this pen. I wondered if my hopes for this pen were too high. Was I seduced by hype around this pen? I tried to like it, really I did. See? SEE? It blotches. I'm even using a pen-wiper. Yes, using a pen-wiper makes me feel a little like Jo March, but that's not enough to offset the problematic aspects of requiring a separate place to wipe your pen's nib periodically. But I don't have to justify not liking the pen. I don't like it. I don't have to like it. I (gasp) don't even have to use it up. (Those whose parents also never got over their Depression-era childhoods will understand the radical nature of this statement.) So I might channel my inner rebel-child and not keep using it! I appreciate that someone made this pen. I am grateful to live in a world that includes ballpoint pens, and people who make them, and an economy in which I am able to buy ballpoint pens and paper, and a life in which I get to use pens and paper regularly. And yet. I don't like this pen. I don't have to force myself to try to like it. I don't have to find value in it. I can just sit here not liking this pen. And that's OK. We don't have to like the same things. I will buy a different kind of pen next time. You can continue to love this brand of pen, if you wish. Note: "Not liking" can also apply to other things, like books, essays, short stories, poems, or artwork. This Saturday! From noon until 4! I'll be at Chapters in Thunder Bay, along with a bunch of other Thunder Bay/area authors (including Roy Blomstrom, author of SILENCES: A NOVEL OF THE 1918 FINNISH CIVIL WAR) (and also my husband) representing our books through Shuniah House Books. If you're in the area, come in to meet folks, buy books or have them signed, and/or enjoy a beverage in the air-conditioned comfort. The most up-to-date list of other participating authors: Sandi Boucher, Sam Convey, H. Leighton Dickson, Roma Fisher, Makenzi Fisk (publisher of, among other books, Canadian Shorts, which includes a short story of mine), Deanna Ford, Eva Kakepetum, Rob Kozak, Michelle Krys, Kyle Lees, Terrence McParland, Merk, John Pringle, Shannon Robertson, Evan Sills, and the Friends of the (Thunder Bay) Library. It's summer, which is a lovely season here on the Lake Superior north shore. I'd like to spend more time out there enjoying it, and less time at my desk. Also, it's prime visiting time here, which is also fun. Therefore, I'll be not 100% "out of the office," but not exactly in the office, until September. I may pop in here with news or items of interest. I'll be off Twitter (mostly) (I hope) but I'll be around on Instagram @marionagnew and I'll pick up email. Wherever you are, whenever it is you're reading this, I hope you're able to enjoy being where you are. 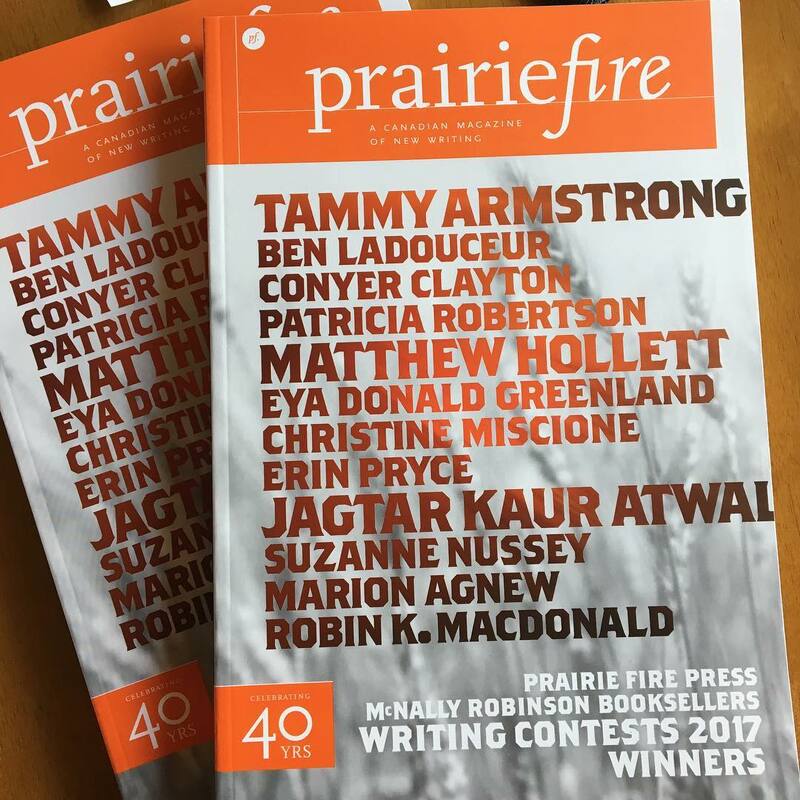 The most recent issue of Prairie Fire arrived! It includes my essay, "Hours of Daylight," another from the collection about my mother and her illness and our family. I'm so pleased that Betsy Warland recognized it and I'm honoured that it appears in this company. Managing journals and contests is a lot of work, and I appreciate the effort that groups across Canada put in to make our work available to readers. Thanks so much, Prairie Fire! I've read a bunch of really great books lately, including this one. I especially like this quote, page 215: "In the long run, the revision process feels better if you approach it with curiosity. Each editorial mark can't register as a 'mistake' that threatens the spider ego. Remind yourself that revising proves you care for the reader and the nature of your ambition." Curiosity. Check! Back to work. "hope--a new constellation/waiting for us to map it/waiting for us to name it--together"
Today, I remember that the "American" continents look the way they do because of theft and murder, the shameful dismissal of lives, human and other. That the exploitation is redoubled, today. And I remember that we can again face the stars and map that constellation. Hope. Here is the full text of Richard Blanco's Inaugural poem, "One Today." "One recent morning, I went for a walk and saw a dog." My essay "Entanglement" has appeared at Atticus Review, a daily online journal that provides "a platform, not a pulpit." You can check out my essay at this link. I'm thrilled to have work in this publication! The Nonfiction page alone has many gems, though given my stubborn streak about relating quantum physics to love and to dogs, I'm especially drawn to Infrared, by Morgan Conyer. Many thanks to the folks at Atticus. All publications, whether print or online, require time and dedication as well as a strong commitment to public discourse. Again, thank you. My essay, "Let d Be the Distance Between Us," is currently available at The Grief Diaries, "a magazine of art and writing about loss." It's part of their Volume 4, Issue 1 Anniversary Issue. I invite you to read it! While you're there, check out the other writing and art--lots of crackerjack intergenerational nonfiction as well as moving fiction, translations, poetry, art, and a photo essay. Beautiful work in this current issue as well as in the archives! It's exciting to have work in part of a larger conversation about mothers, daughters, love, and grief. I'm grateful. Over at "Off the Shelf," the blog for the Thunder Bay Public Library, you can read an interview with me. In it, I talk about working with scientists and engineers, publishing in literary journals, and the big umbrella that is "creative nonfiction." Shauna Kosoris asked great questions, and I had a lot of fun answering them. Thank you so much for the opportunity! In one of my answers, I mentioned revising one particular essay many times--I'm pleased that this essay, "Entanglement," has been accepted by Atticus Review. Stay tuned for its publication date. While you're at "Off the Shelf," check out some of the other content--book reviews, recommendations, and interviews. Issue #146 of The New Quarterly is now available in print in bookstores and by order from their website. Because "Atomic Tangerine" appears in that issue, my "writing space" post also appears on their blog this month. You can see it--an example of judicious photo cropping--at this link. They make selections of their current issue available for free to non-subscribers for brief periods online; you can read all the back issues by subscribing to their newsletter. Thanks, TNQ, for taking such great care of my piece and ensuring that people are able to read it. I often make mistakes, and try to own them, which means I also look for courses of action that are "never wrong." I wrote about this recently. To that list, I will add something else: going for a walk. Especially when you can retrieve beautiful objects like those below. Or even when you simply enjoy beautiful moments and create beautiful memories. I am so sorry that our group of people talking disturbed you. Some of us didn’t know we were in a designated quiet space, and some of us knew but didn’t remember and were thoughtless. None of which matters. All of us were rude and disrespectful. I’m so sorry for that. I have no excuse. I wish I could un-do it, or make it up to you. I wish I could restore to you the hours that you had hoped would be productive. I’m sure you didn’t get everything done that you’d planned to because we were noisy. More than that, I wish I could give you back your inner peace—the positive resolve with which I imagine you approached your study session in the library. I try to picture your day up to that point. You kissed your kids and slipped out into the morning, skipping breakfast. You wanted to be early to your work shift so you could leave on time and spend your afternoon with your project. While you cleaned or filed or taught or washed dishes or researched or treated patients or served people, you ignored your fatigue and coaxed part of your brain to consider your project. To make connections. To create the exact phrase that expresses what you mean. Something specific and unique to your experience but building on or arguing with ideas and traditions from the past. When your work shift was over, did you battle more than weariness to get to this study session? Did you combat imposter syndrome to even go onto campus? On your way up the hill and through the library doors, did you have to remind yourself to breathe? Yes, you belong there. Yes, I belong here. When you sat in that quiet space and opened your laptop, how did it feel to be surrounded by shelf after shelf full of volumes of established wisdom, which you’re challenging and subverting? I don’t know you—or you or you, all the people sitting at all the tables. I know that each of you has a different story. Most of all, I know that it cost you a lot of emotional energy to complain to the librarian when we weren’t respecting the quiet space. It’s so wearing to have to claim space in the world all the damn time. Especially when you had picked a space that’s officially set aside for quiet work. And because our group behaved rudely, you had to claim that space again. For what it’s worth, I’m so grateful you said something. You shouldn’t have had to. I can’t give you back what I, though my lack of respect, took from you that afternoon. I will do my best to learn from the experience so I don’t make this same mistake in the future. And now I will stop claiming your energy and attention—yet again—and re-apply myself to learning. 3. Throwing in a load of laundry (water levels permitting). Hmm, is there a relationship between those three? 4. Slowing down to look, REALLY LOOK, at something. Maybe taking a photo. 5. Being open to *hearing* input while staying thoughtful about *implementing* it. 6. Saying "What do you think?" and "That must have been difficult" or "How interesting." I'm pretty good at #4 but need work on #6. And #5 is always a work in progress. 7. Keeping an extra loaf of bread in the freezer. Bonus points if it's raisin bread! 8. Making scones. Because scones are never wrong. I recently received word that my essay, "Let d Be the Distance Between Us," will appear in the June issue of The Grief Diaries. I very much appreciated their interest in providing feedback on an earlier version, and my piece is stronger for it. Also, I'm eagerly anticipating the chance to get together with other Creative Nonfiction folks in Toronto at this weekend's annual conference of the Creative Nonfiction Collective. The Friday master classes are sold out and conference registration itself has closed, but there are still several events for which you can just buy a ticket and hear an awesome speaker or several. This year's conference program is here. These "new beginning" events mean a lot to me. This time of year is difficult. My mother's birthday is tomorrow--she would have been 101 this year--and her death anniversary is early next week. Of course, Mother's Day is also looming. Although I think of my mother every day, even 18 years after her death, these anniversaries are extra poignant. I enjoy the chance to be with others, both in person and in online publications, who are making sense of their lives through art. I've been thinking about writing as water. Or swimming. Or something. In this mental picture, the surface is where writing interfaces with the world--maybe publication, maybe beta readers, maybe a trusted editor. Someone other than the writer. Deep water is where ideas lurk and grow. It's where the writer opens herself to recording what is actually happening, as opposed to what she might wish were happening. Where she makes connections among disparate currents, where she finds what she's afraid of and works it into the drafts. Over time, drafts edge closer to the surface. For the past couple of years, I've been working nearer the surface, with words I first wrote 20 years ago. How do they still make sense to me, if they do--or do they make sense in a different way? How do they resonate emotionally today? What feelings have I managed to relinquish through the years, and what have I come to understand that lets me feel these events differently? 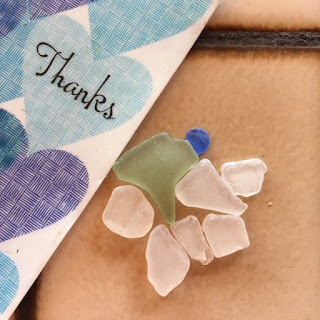 To make these connections, I do find it helpful to hang around in slightly deeper water--but the goal is always to bring these words to the surface to interact with other words there. Sometimes the words from the deeper layers fill in gaps that didn't exist back then; sometimes they are clearer labels for the confused tangled mess of my notes. And of course I hurry the process more than I should. Nearly always I imagine a first (or fourth) draft to be "ready" and I drag it to the surface. Sometimes those drafts really are publishable, but often they don't answer the "so what? "-type questions thoroughly. Giving a draft more time, or dropping underwater to play for a while, lets me make the work more rich and satisfying. In both fiction and nonfiction--the novel on its umpteenth draft, the essay collection that's finally ready for prime time--I've been revising, revising, revising and then polishing before going back for another revision. For years. It's been a long time since I let myself sink into deep water with no purpose other than to watch the play of light and shadow. My recent vacation gave me that chance. And yes, interesting things bubble and flow down there. Meanwhile, I have more work to do near the surface, which is also rewarding. Especially knowing that the water is still deep, with fascinations that nurture me. Yesterday was the first Wednesday in a couple of years, I think, in which I didn't post something. I was traveling and enjoying being (mostly) offline. As you know, I've been on a vacation in which I've actually been...vacating. It's been great! I've thoroughly enjoyed visiting my sister, seeing her world (the sun! so many degrees on the thermometer!) and her part of the country, and experiencing a change in routine. But I love living here. So one of the highlights of the whole trip: crossing the border yesterday and hearing the agent say, "Welcome home." And it really is, pale sunlight, muddy driveway, filthy floors, dripping eaves, and everything else that goes with spring in the North (which yeah is south of most of the continent). Of course, all that is easier to greet with open arms since I missed the most recent dump of snow and mega windstorm, which my husband delights in describing in great detail as he pounds on the walls. "Every door was snapping, loud bangs, like this loud!" I've got a quick weekend trip coming in a couple of weeks but otherwise, I'm home for the foreseeable. It's a good time to get stuff done, especially with a vacation-refreshed spirit. Here's what I've been looking at and doing recently. I don't believe in "inspiration" much, but I am a fan of "renewal," and that's what I've been fortunate enough to experience this vacation. Next week, I'll be back in the land of "yes the sun is shining but it's not WARM," and I'll love being there, too--because it's home. One way I relax (okay, about the only way, and often it should be written "relax") is to draw lines on paper. I don't mean it to be art. It's something to do when I try to unwind. I like lines and I like colo(u)rs and I like to do things with my hands. I've written about this before, apparently. It's kind of shocking to click that link and see that I also didn't like to do much beyond writing and reading back in 2011. However. I bring this up because I wondered last week how I know I'm a writer and not a visual artist. Perhaps, I devil's-advocated myself, writing is comfortable--not a calling, nothing more than an old, broken-in shoe of an activity. When I was a kid, art seemed to require tools we didn't have, like easels and paints and wheels and kilns. Also, art required getting messy, which was sort of problematic in the house I grew up in (it made more work for adults). In contrast, writing required... a (sharpened) pencil and paper. The topic came up mostly because I have been drawing lines on paper for some time, and I'm working in a slightly larger sketchbook than I have in the past, and I'm going on vacation (I'm vacating as you read this), and I need to decide what I'm going to bring art-wise on vacation. Although to be fair, bringing art supplies to my sister's home is like coals/Newcastle. What I've learned is this: although I enjoy drawing lines and learning various techniques, I generally don't know what to art. Like, okay, so I can draw vaguely photorealistic scenes from photographs. Yay? What is the point of that--to me, even? The answer: the point is to do it. The point is not the product--I don't have to make something meaningful or beautiful or sell-able from visual art/drawing/colo(u)rs. In my life, writing is also about the process--and the product. Both. I do want to create something that a reader can be affected by, preferably in a positive way. I want (most of) my writing to be read. But my drawings are mostly for me, or to serve as an Instagram subject when I'm tired of taking pictures of snow when the calendar clearly indicates that Spring has sprung. In the interests of broadening my horizons beyond writing and reading--and even drawing lines on paper--I'm not writing while I'm on vacation. I brought no projects. I have no expectations. I'm not sure how I feel about it. I hope to be hungry for words when I return. Here are some random thoughts that have floated across my consciousness recently. They're mostly related to "belonging" and "home," which are, not coincidentally, themes of "Atomic Tangerine," soon to appear in The New Quarterly. 1. I picked up my Canadian passport. Now that I have the ability to leave and return to the country as I wish, I feel more comfortable about staying. There's probably something to examine there. Maybe it's just typical human nature. Maybe I'm part cat, wanting out from in and in from out. 2. Speaking of the Canadian citizenship ceremony, it was...interesting. Sweet, actually. Held at a local high school. One of the school's students was becoming a citizen. I managed to repeat the oath and sing the anthem. And I now have all the lapel pins a new citizen could ever want. 3. Still on the citizenship ceremony: I've always liked "Uptown Funk"--catchy hook, great video, what can I say, I like pop music--but now have an even stronger connection, given the high school jazz band's rendition of it during the ceremony. Including jazz solos! Not a musical number I'd have predicted for the day. In fact, overall, the ceremony didn't go exactly the way I'd have imagined a citizenship ceremony. I would have anticipated something more solemn--somber, even, with talk about duties and responsibilities. Instead, mine was was celebratory and welcoming. It featured young people, themselves relatively new citizens. To which I can only, in the words of the song, "hit a hallelujah (woo!)." The theme for March has been "postpone." Because of illness, a friend postponed a get-together. For some mysterious physicians' reasons, a medical appointment has been delayed. Travel issues have caused a family visit to be postponed for months. As a result, my schedule has room to breathe. And therefore, deadline that I had given up on meeting is now not only possible but reasonable. Because of this room, I can not only "send something" just to be sending something, I can send something that's recently revised and re-considered. Perhaps even re-re-re-considered. It's a good goal. So I will take advantage of fun (and appointments) deferred and meet it. On the flip side, I'd planned to make a blueberry cobbler for the visitors. Even though they're not coming, it's still on my list for this evening. Because a cobbler is a sort of pie, and today's pi day, and my cobbler topping is scone dough, and (as we all know) scones are never wrong. Some pleasures can be savored when they're postponed. But sometimes, making the cobbler is still the right choice. And new space in the calendar is a gift that I don't take lightly. The days are getting longer, but the ice remains on the roads, and therefore, my walks remain on the treadmill. Which means I listen to podcasts. I was especially excited to see notice of the return of this podcast: Missing & Murdered. This season focuses on learning the story of Cleo, a young girl from the generation of the "Sixties Scoop." As I said here, I learned so much from the first season of this podcast--among other issues, how and why some people might zero incentive to cooperate with authorities. True-crime podcasts can feel squicky, in the way that reality TV shows can: exploiting tragic stories for sensationalism, fame, or ratings. I have wondered whether I'm "done" imbibing crime stories, whether those stories come in the form of books or podcasts or even longform journalism. I haven't decided. But even if I declare a personal moratorium on similar podcasts, I will continue listening to Missing & Murdered. First, it doesn't feel exploitative. (To me, at least; your mileage may vary.) I also learn so much culture and history from the families and their willingness to share their experiences and stories. I said it before, and it's still true: I feel honoured to have the opportunity to listen. And, as always, listening is important. At the end of a month, any month, every month, I take stock of what I've done and what's happened. Things that are inside and outside of my control. In the past couple of months, I've spent a lot of time reading and sitting with other peoples' work, talking about writing and arts, talking about the writing process--talking in general. And the flip side, listening. For the most part, it's been a really good experience. I've learned a lot. I hope other people I've interacted with know how grateful I am to have had the opportunity to hear their perspectives and share my own. It's been a lot of reading, talking, and listening. Not so much writing. Which I'm looking forward to changing, as I turn the calendar page. At this time of year, I have to keep reminding myself that I don't always get to decide when something is done. I may be sick to death of revising, but that doesn't mean the essay is "done." Similarly, I may be sick to death of dressing in ninety-eleven layers and wearing boots, but that doesn't mean winter is "done." On the other hand, *I* can be done with something--like *I* can be "done" revising an essay. For now. *I* could even be "done" with winter. As it happens, I haven't yet scheduled a trip to visit my sister (who, conveniently for my attention span for winter, lives in Tucson), so I'm not quite "done" yet. Later, I can revisit the essay. If it's still as "done" as I can make it, then I can send it out. One reason I haven't yet scheduled my sun-seeking trip is that I want to be sure that the time away is worth the return to a landscape that hasn't actually let go of winter. Even if all the snow melted tomorrow and we got nothing new, the weather can remain cold well into late April and early May. (I keep fleece jackets on hand for summer visitors, who are usually sure they don't need them but usually do.) Once I'm sure I'm ready to come back, I can feel better about going. So, I'll set aside that essay, until I have fresh eyes and can see if it reads well. I can wrap my shoulders in sweaters and my hands around a mug of coffee, until I'm warm enough to put on even more layers and go out to enjoy the returning sunshine. And while I'm warming up, I can even consider whether shortening the second section of that essay--or better yet, dropping that thread altogether--would help that essay become more nearly "done." Next weekend (in ten days), as I've mentioned, I'll be participating in the "Ask an Author" event, sponsored by the Northwestern Ontario Writers Workshop. As part of the lead-in to that event, I contributed a post to the NOWW blog, sharing a little about my background and writing history, what I'm working on, and how I feel about peanut butter on toast. I invite you to go there and read this, and be sure to scope out all the other participants in the event, as well. There are many ways to "be a writer"--far more than the six we represent!--but we are all happy to share the pitfalls and rewards of the path we've taken to get here. I've mentioned before that one of my favourite podcasts is Scriptnotes. It is, as the subtitle says, a podcast about screenwriting and things that are interesting to screenwriters. John August, a screenwriter and the originator of the podcast, is launching a new middle-grade book series soon, featuring a character named Arlo Finch. He's also launching a podcast--limited-episode, apparently; the "mini-series" equivalent of podcasting--in advance of his book's launch. The new podcast is called Launch, and it's presented by Wondery. In it, he talks about his book and what he's learned in the past two years as he's entered a new realm of storytelling. He even got to see his book being printed, which is pretty cool. I've listened to several episodes, not all (yet). However, what I've heard so far is a great basic resource for answers to some of those questions. I recommend listening. And if you're interested in lots of "how to" answers about screenwriting, storytelling, taking criticism, procrastinating, and the general creative process, dig around on the Scriptnotes site. It holds a lot of answers. 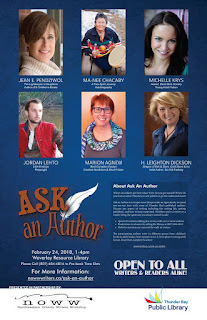 Here's a neat event: it's Ask an Author! Similar to the Human Library, this event lets you sign up to ask writers about whatever you want to ask about. It's an honour to appear with these writers--I'd like to sign up for 20-minute chats myself! So mark your calendars for February 24, in the afternoon. You can sign up in advance, but half of the slots will be held for people who appear at the door. Thanks very much to NOWW and the Thunder Bay Public Library for organizing this event and for supporting writers in general. I mentioned a couple of weeks ago that I was going to read at an event sponsored by NOWW, the Northwestern Ontario Writers Workshop. However. I don't always enjoy reading "tonight" or even "day after tomorrow." As usual, the experience was really fun. I so appreciated the attention and respect of the people who showed up. And it was great to hear others share their work as well. In any case, introducing my novel to other people was nerve-wracking, but I'm glad I did it, and I appreciate all the encouragement and support. So now, back to work--writing, revising, and even a little dreaming. 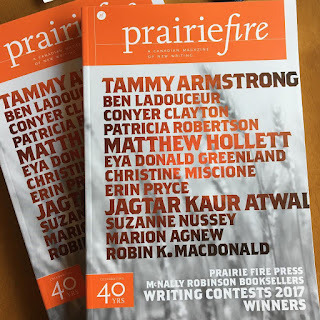 I had wonderful news recently: my essay, "Hours of Daylight," won third prize in the creative nonfiction division of the 2017 Prairie Fire writing contest. It will appear in their summer issue, along with all the other fabulous contest winners. Excerpts from winning entries in all three categories are available here. It's such an honour to appear in the company of these writers! I'm looking forward to reading this issue. I haven't quite decided what I'll read yet, but I will soon, and then I'll start practicing. Because no matter how many times I read a piece aloud before I submit it somewhere (and that's a lot of times), reading in front of other people is a VERY different experience. And a fabulous one. Audiences are so helpful to writers who are working to better understand how people read them. (And isn't that all of us?) Because my husband and I live in the country and getting to town of an evening can be difficult in winter, I don't get to every single event where it's possible to hear people reading or performing their work. But I love it when we're there. The audience doesn't get to just sit there--you're part of the event, even if the event is formal (no finger-snapping, as at some spoken-word events). Your attention is a gift you give the person reading. You're receiving gifts, too, of course. First, I get to hear someone tell me a story. And second, I have to find that listening space in myself to hear the story. It's a brief time period when I stop the natter in my head and allow someone else's words to penetrate. Being there, in that moment, with that reader, is hugely rewarding. It's a nice time of community. I'm really grateful for the opportunity to read. A couple of years ago, I wrote about my best life-simplifier, indulgence, and challenge. Every time I use those iced-tea spoons, I am grateful I got them. Last/this year, my best life-simplifier is combined with my best indulgence: I got an egg cooker. Years ago, I received one from a cousin but somehow lost track of it in a move. So I bought a new one, and I even paid $5 extra to get it in teal. (Indulgence.) The colo(u)r makes me smile. I've used it often. I eat eggs for breakfast almost every day, and having them cooked and waiting in the fridge makes mornings (not my best time) so much easier. Two years ago, I mentioned saying NO to most things, so that I could say YES to others. I still try to do that. Specifically in the writing world, I have said YES to things that scare me, and as a result, submitting work to publications is now easier. This year, I'm in the position of submitting entire manuscripts for the consideration of strangers--a new level of scary--but I anticipate that THAT process will get easier, too. I am also renewing my desire to say NO to news alerts. A resolution to express gratitude, every day, for my life helps keep my adrenaline even. (Well, more even.) My reasoning: in an apocalypse, I want to be aware of the gift of having lived in this beautiful, imperfect world. The habit of staying out of social media except at prescribed times is, shall we say, still under development. As for the third thing I mentioned 2+ years ago--ordering extra socks and underwear--it's about time to do that again. The cold snap came early this winter, and our well usually freezes up at some point in the early months of any year. Might as well be prepared. These simplifiers, indulgences, and challenges will help me face those parts of 2018 I can't predict or anticipate. Or so I hope.